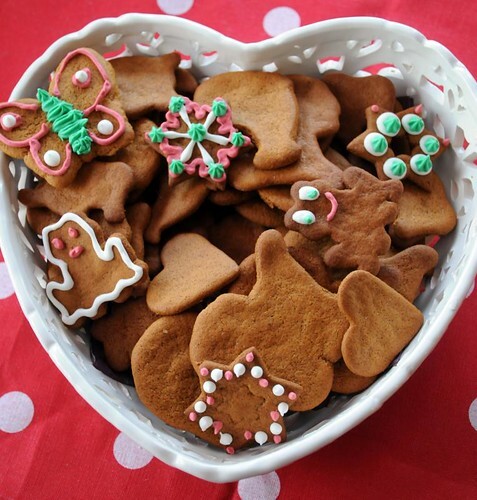 I've made gingerbread cookies (known as Pepparkakor here in Sweden, and probably gingersnaps in most of the world) many times, and I've tried several different recipes. You can always buy your dough chilled in the grocery store this time of year (possibly at IKEA for those of you who aren't in Sweden) but it's incredibly easy to make your own. This recipe is quite different, since it doesn't contain butter. It's certainly not a "diet" sort of recipe though - it has plenty of sugar and cream. The cookies are really flavorful, and with an almost caramel crunch. Irresistible! The dough should rest in the fridge for at least a few days (and up to three weeks) so make it right away! And you'll get a LOT of cookies. I divided my dough into six portions, each one made about two baking sheets of cookies. It'll all depend on the size of your cookie cutters. And save those with tiny details for another recipe, because these tend to fluff up a bit and don't hold their shape as well as some others I've tried. However, the taste more than makes up for that. Mix cream, golden syrup and sugar in the bowl of a stand mixer, or stir together by hand. Add all the spices and the baking soda, along with half of the flour. Gradually add the rest of the flour until you have a nice, supple dough that's not too tacky. Divide into six logs, and place each in a plastic bag or plastic wrap. Keep in the fridge for at least a few days, but preferrably a week. what else can we use instead of golden syrup?maybe honey? Kari - I use single-use piping bags, but very heavy-duty ones. (The ones from Toppits are ok too, but these are sold via Bakers, and I got them at Martin Olsson.) And then I use a coupler and various tips from Wilton. I made this today and made one lot of biscuits without resting the dough. I must have done something wrong. The dough was very pale and the gingerbread came out looking like regular sugar cookies rathan than gingebread and were not as spicy as I expected though they were still quite nice. The dough was very sticky, maybe because I had not rested it and I did not manage to roll it very thinly. 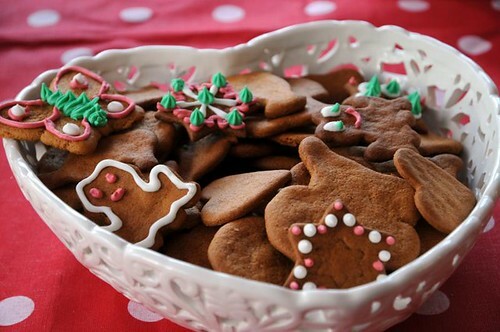 The baked cookies are very hard and do not have the melt-in-the-mouth quality of store bought gingerbread. Is there any hope for my remaining dough? I followed the recipie exactly except I might have used too much golden syrup as I did not measure it, just poured it from the tin. I used more or less a whole 454g tin of syrup as it looked to contain about 300 ml. Any ideas Anne? Anna - how weird! The wrong amount of syrup would definitely cause it to be much more sticky, but shouldn't affect the spiciness that much. I didn't try any dough right away so I can't say for sure - but it was very spicy after a week's rest. The only thing I can think of is that the spices might have been old and weak..? I hope the rest of the dough is tastier! Perhaps I can help regarding the syrup. I'm from Sweden but live in the US and use molasses (made from sugar cane)when I bake my ginger snaps. I have not found any light colored molasses so the flavor will be a bit more intense. Using syrup (like pancake syrup)will really mess up your dough. I apologize if you've answered this aleady in another post, but when you say "golden syrup" are you referring to the Ljus Sirap from Dan Sukker or something like Lyle's Golden Syrup (British)? Maria - either. I use "Ljus Sirap" but I'm sure Lyle's would turn out great too. Thanks for posting the recipe! I'm Canadian used to live in Sweden when I was a child and this recipe reminded me of my childhood there! I was able to bake successfully the cookies using molasses. Only thing was that my dough came out a bit tacky/sticky, but easily resolved by adding more flour. Also, I noticed it used a lot of sugar, so I cut it by 30%, and it still was very good! I live in the US, and have used Karo pancake syrup instead of golden syrup with good result. My recipe only ask for 1 dl of syrup.